Beachwalk Homes Beachwalk Homes: Gorgeous home in prime location Beachwalk elegance at its best! Call it home! Magnificent open kitchen with volume ceilings and flooring. Walking distance to Beach, Mercato, Pavilion shopping, fine dining and more. Gated and Guarded private community with tennis court, club house and amazing neighbors. Beachwalk Gardens Beachwalk Condos: *** WELCOME HOME *** LOCATION - LOCATION - LOCATION! STUNNING three (3) bedroom condo, end unit, ground floor, adjacent to the walking gate to Vanderbilt Beach. Master bathroom - WOW! Updated kitchen - WOW! Contiguous flooring throughout condo, carpeting in two (2) bedrooms. Crown molding; baseboards; hurricane shutters on lanai and master bathroom; hurricane impact glass windows; the Goodie list goes on, and on, and on. If you are looking for a charming condo that says "Welcome Home", look no further. Beachwalk is a low density, walled, man gated community close to Vanderbilt Beach. There are two (2) heated swimming pools; six (6) hard tru lite tennis courts; bocce court; clubhouse with scheduled activities. Comcast High Definition TV and Internet are now included in HOA quarterly dues. 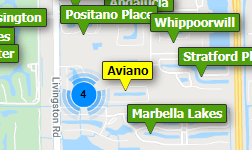 Beachwalk is in walking or biking distance to several restaurants; theaters; Publix; Mercato. If you are interested in renting your condo, you can rent your condo twelve (12) times a year and the seasonal rental demand for Beachwalk is HUGE. Call for a personal showing today. Beachwalk Homes Beachwalk Homes: Walk to the Beach from this Private DETACHED single-family 2 Car Garage home in charming BEACHWALK. This gently used bright and cheery home is a South-facing, Cul-de-Sac, non-smoking, no pets, never rented home, and has been loved and meticulously cared for by the original owners for 30 years. They picked this spot for it’s all-day-long sunny wrap-around patio, spacious bright cheery interior with Volume Ceiling and tons of driveway space! Solid concrete block construction stood strong through IRMA. Roof, HVAC system, Electrical and Plumbing systems are all in pristine shape. Enjoy the beautiful clubhouse with 6 Har-Tru tennis courts (2 lighted), charming winding streets, lots of social activities, Bocce Courts and Exercise Room. Guarded/Gated Community. Make it your own or rent as an investor. The community is also walking distance to shopping, movie theaters, dining & library!! Beachwalk Gardens Beachwalk Condos: *****$10,000. ***** PRICE REDUCTION! OWNER WANTS CONDO SOLD! LOCATION - LOCATION - LOCATION! Walk to Vanderbilt Beach. THREE (3) BEDROOM Condo with a western PRESERVE view!, is close to the secure walking gate to beach. BEACHWALK is a LOW density, walled, man gated community, 24/7, 365 days a year. There are two (2) swimming pools; hot spa; six (6) har-tru lite tennis courts; bocce court; herb garden; clubhouse with exercise room and scheduled activities. Walking distance to Pavilion Shopping Center; theaters; the Mercato; Public Library; Publix; urgent care center and several popular restaurants. Rentals: you can rent your condo 12 times a year. Seller is offering a One (1) Year Home Warranty. New Trane AC - 2018. It does not get any better than this! Call listing agent and make an appointment today, easy to show. Beachwalk Gardens Beachwalk Condos: C.14989 Tastefully renovated bathrooms and kitchen offer tremendous opportunity in Beachwalk. Stunning location with 1/2 mile walk to the beach. This 2nd floor preserve view condominium is being offered TURNKEY. With 1350sf of living space and an excellently planned layout with private split bedrooms, this home feels spacious and comfortable to either relax or to entertain for an evening. In addition, it includes a Florida Room that is enclosed with newly installed PGT Full Impact Glass sliders, gorgeous fully remodeled bathrooms, remodeled kitchen with an eat-in bar area, large 18" tile set on diagonal, and a quiet and peaceful lush preserve view off the lanai. Please note that there are approximately $38,000 in upgrades since 2014 in impact windows, bathroom/kitchen renovation, new AC and new hot water heater. Beachwalk is a gated community offers social activities to suit everyone with resort style amenities featuring two heated pools, bike/jog paths, clubhouse, bocce, tennis, pickle-ball and fitness center. Make it your full time home or excellent monthly rental opportunities. Start enjoying living just a short stroll from the beach and shopping! Beachwalk Villas Beachwalk Homes: Walking distance to Vanderbilt Beach! This villa is the lowest priced in BEACHWALK Community. Affordable with beautiful sunsets, this is it! Large villa with private views. Beachwalk has lots of amenities to suit every age group. Conveniently located near Mercato for shopping and dining. Take a look and make an offer before it's gone! Beachwalk Gardens Beachwalk Condos: Perfect for a fun, active lifestyle, this bright, top-floor condo in Beachwalk has a lot to love! The great room has warm wood flooring, vaulted ceilings and transom windows giving it a stylish contemporary flair. It has an eat-in kitchen with a sunny breakfast nook, lots of counter space and a pass-through to the dining area. The split floor plan features spacious bedrooms with walk-in closets, a good sized great room with screened lanai offering western views of sunset skies. Fresh carpet and paint in chic, neutral tones make it move-in ready! Beachwalk is one of Naples most fun communities, located just a few blocks to Vanderbilt Beach with lots of trendy restaurants, great shopping and entertainment within walking distance. It has 2 sparkling pools, tennis courts, bocce, and a community center with gym. Need professional assistance selling your property at Beachwalk Naples? Find out how an Area Specialist can help to generate more property exposure in order to get the most money for your investment in the least amount of time.